Frances Katherine (Marcionek) Baran, 87, passed away peacefully Friday, February 8th at home surrounded by the love of her family. Franny was born in Westfield on March 13, 1931 to the late Ladislaw and Mary (Kowalczyk) Marcionek. Her brothers and sisters nicknamed her Dolly. She was a lifelong resident of Westfield. She worked in tobacco and at the Sundown theater before becoming a full-time homemaker and mom. She returned to work at Valley View Nursing Home for over 20 years before retiring to help care for her granddaughter. She was a communicant at Holy Trinity Parish in Westfield. 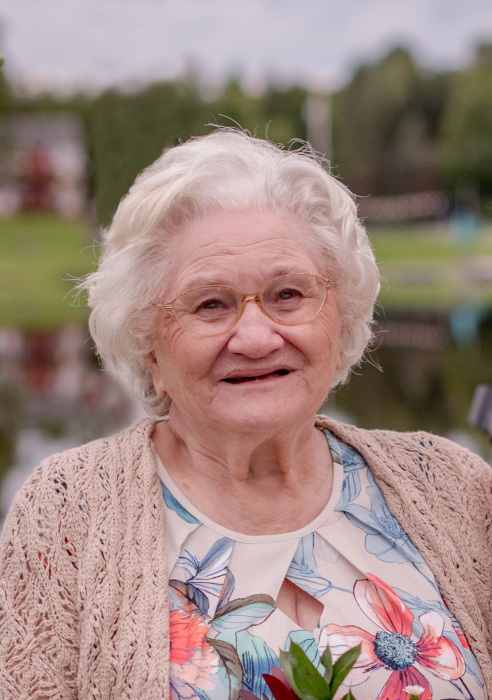 Franny was known for her golumpki, pierogies, peach sauce, and crepes. She always enjoyed her daily toast and coffee. Whenever you shared a delicious meal with her she would comment, “Good, good groceries.” She was an avid candlepin bowler and her favorite saying was “right down the middle.” She took joy in spending time with her family, especially the mini adventures she had with her daughter and granddaughter. Fran enjoyed tending to her gardens, feeding the birds, and caring for all her animals. She was easy going and appreciated the simple things in life. Frances was predeceased by her beloved husband Matthew Baran on September 8, 1979. She is survived by her beloved daughter Christine V. Cox and her husband Steve of Westfield, and was a cherished Nanny to Stephanie A. Liptak and her husband Andrew of Belmont, and Jason Cox of West Springfield. She will be dearly missed by many nieces, nephews and all who knew her. The funeral for Frances will be Friday, February 15th, with calling hours from 9:00AM-11:00AM at WESTFIELD FUNERAL HOME AND CREMATION, 4 Princeton Street in Westfield, with a Funeral Home Service at 11:00AM, followed by a burial at St. Mary’s Cemetery. In lieu of flowers, memorial donations may be made in Franny’s memory to Thomas J. O’Connor Animal Control and Adoption Center. Please visit www.westfieldfuneralhome.com for Frances's memorial page.